Agnes Denes (right) was one of the pioneers of the environmental art movement. Ian Siddons-Heginworth has developed Environmental Arts Therapy and has a book on the subject. Helen Moore is a poet and her website is a showcase for ecopoetry/ environmental art projects/teaching, and an evolving home. Feral Theatre is an eco-arts project based in Brighton. Last of the Curlews is their latest performance at TEDx Whitechapel, London. Adbusters magazine offers a clever critique of modern culture through the medium of advertising. Here is their special issue on ecopsychology. Chris Drury is one of the leading land artists in Britain. One of his projects called ‘Heart of Reeds’ (left) is a reed bed on the edge of Lewes, Sussex inspired by images of the human heart. Sculpture Garden in Overstrand, Norfolk by Peter Talbot, is a beauty on the cliff edge. 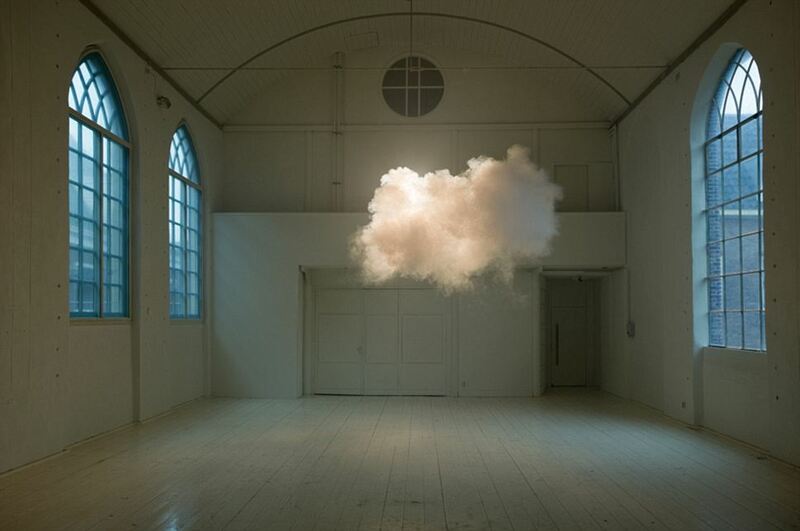 Berndnaut Smilde creates conditions for clouds in rooms. Bavarian artist Nils Udo offers a symbolic piece ‘The Nest’ on home. ‘Double Vision’: Self Portraits of the Earth. Earth began birthing in the Milky Way approximately 4.57 billions years ago. Earth has been a practicing artist all her life, concentrating on beauty and devastation within nature. After her latest and most famous ice installation she began to explore expression through a multitude of life media. Quite recently this has included the species homo sapiens. In the last c. 200 years a particular aspect of this project, homo industrialis destructivensis, has become increasingly separated from her other work. In this short time there have been dramatic changes in her art, which seem to reflect her increasing ill health. In particular, technological advances have gone hand in hand with climate disruption and pollution. These rapid new departures are reshaping her current work in profound ways, and even limiting the diversity of her creative expression. (She is losing 75 species per day, perhaps more). One wonders whether this particular phase is coming to an end, as homo industrialis destructivensis is dominating Earth’s artistic endeavors and threatening her creative spirit. Or will radical changes bring that part of her expression back into balance?